The Two Fingers Tequila is made at a large family-run distillery in Los Altos, producing two expressions - Gold and Silver. Previously the brand was bottled by Hiram Walker, though they are currently owned by Heaven Hill, the company behind many fine whiskey lines. In 2008, Heaven Hill redesigned the Two Fingers Tequila bottles, with clear glass and a simpler label. 75cl / 40.0% - A tasty gold tequila, this was produced in the Los Altos region in the Jalisco Province. The distillery is family run, and the tequila is made from Mountain Blue agave plants which have been aged for between 8 and 10 years. Heaven Hill Distilleries, Inc. announces a new package design for its Two Fingers Tequila line. 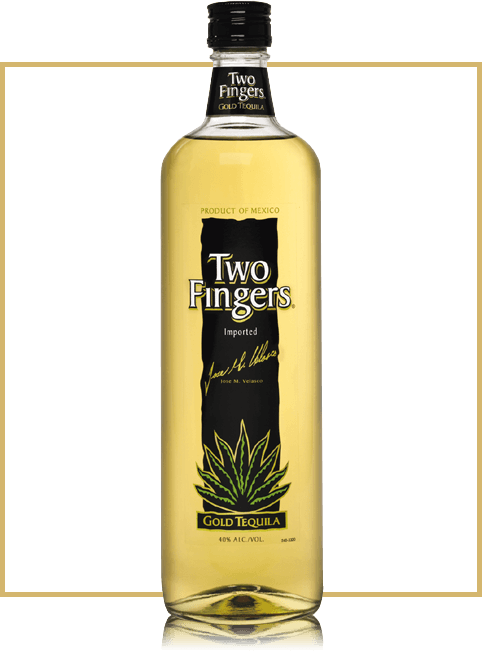 The new Two Fingers look is more in line with the Tequila category while maintaining the brand’s unique flair. The package redesign includes a clear bottle and a more streamlined black label prominently featuring a Blue Agave plant.